Good Night, and Good Luck. is a 2005 historical drama film directed by George Clooney and starring David Strathairn, Patricia Clarkson, Clooney, Jeff Daniels, Robert Downey Jr., and Frank Langella. The movie was written by Clooney and Grant Heslov (both of whom also have acting roles in the film) and portrays the conflict between veteran radio and television journalist Edward R. Murrow (Strathairn) and U.S. Senator Joseph McCarthy of Wisconsin, especially relating to the anti-Communist Senator's actions with the Senate Permanent Subcommittee on Investigations. Although released in black and white, it was filmed on color film stock but on a greyscale set, and was color corrected to black and white during post-production. It focuses on the theme of media responsibility, and also addresses what occurs when the media offer a voice of dissent from government policy. The movie takes its title (which ends with a period or full stop) from the line with which Murrow routinely signed off his broadcasts. The film was nominated for six Academy Awards, including Best Picture and Best Director for Clooney and Best Actor for Strathairn. Set in 1953, during the early days of television broadcast journalism. Edward R. Murrow (David Strathairn) along with his news team, producer Fred Friendly (George Clooney) and reporter Joseph Wershba (Robert Downey Jr.) learn of U.S. Air Force officer Milo Radulovich, who is being forcibly discharged because of family members being known communists and his refusal to denounce them. Interest is piqued when it is found that the compilation of charges at Radulovich's hearing was in a sealed envelope and nobody saw them. Murrow presents the story to CBS News' director, Sig Mickelson (Jeff Daniels), who warns Murrow that the story will bring serious accusations and repercussions to CBS and their sponsors, some of whom have government contracts. He reluctantly allows the story to air, which gains positive responses from the public. Murrow also tries to ease the worries of his colleague, Don Hollenbeck (Ray Wise), who is struggling with both the strain of his recent divorce and attacks from newspaper writer Jack O'Brian, who is accusing him of being biased in his news reporting and being a "pinko". Soon after, Wershba is given an envelope suggesting that Murrow has previously interacted with the Soviets and used to be on their payroll. CBS's Chief Executive, William Paley (Frank Langella), brings this forward to Murrow, warning him that if any members of his staff are associated with communism in any way, however remotely, they would have to recuse themselves from Murrow's next story, which is a direct attack on Senator Joseph McCarthy and his crusade against Communist infiltration in the U.S. government, which some denounce as a witch hunt. Friendly and Murrow gather their staff together, and when one of the team members voluntarily excuses himself because his ex-wife had attended Communist meetings before they even met, Murrow concludes that this kind of fear is what McCarthy wants. The team stays together and presents the story, which becomes highly praised by the public and the press, with the exception of Jack O'Brian, who continues to attack both Murrow and especially Hollenbeck on their supposed support of Communism. Hollenbeck pleads with Murrow to go after O'Brian, but Murrow reluctantly tells him that he cannot attack O'Brian while he is busy going after McCarthy. As the team turns their focus to a filmed hearing of Annie Lee Moss, a Pentagon communication worker accused of being a communist based on her name appearing on a list seen by an FBI infiltrator of the American Communist Party, they receive the news that Milo Radulovich is being reinstated by the Air Force, citing no evidence supporting any connections with Communism. Soon after, McCarthy asks for the opportunity to speak for himself on Murrow's show, which Murrow allows. McCarthy openly accuses Murrow of being a Communist, citing several pieces of evidence that seem to support it. Murrow broadcasts a rebuttal the following week, easily disproving McCarthy's accusations and pointing out that McCarthy didn't do anything to defend himself other than accuse anyone who opposes him as being either a Communist or a Communist sympathizer. A few days later, the news arrives that the U.S. Senate is investigating McCarthy, which means the imminent end of his crusade. As the team celebrates, Friendly and Murrow learn that Hollenbeck has committed suicide. Soon after, Paley tells Murrow and Friendly that their news program's air time is going to be severely cut, citing the high costs of the show's production, along with Murrow's attacks on controversial topics. Also, Joe Wershba and his wife Shirley, who both have been secretly hiding their marriage, due to CBS forbidding co-workers being married, are approached by Mickelson, who tells them that everyone knows of their marriage and that he will allow one of them to resign to save face, which Joe agrees to do. The film is framed by performance of the speech given by Murrow to the Radio and Television News Directors Association at "A Salute to Edward R. Murrow" on October 25, 1958, in which he harshly admonishes his audience not to squander the potential of television to inform and educate the public, so that it does not become only "wires and lights in a box". Ray Wise as Don Hollenbeck, journalist for CBS News; accused in the press of being a "pinko". In September 2005, Clooney explained his interest in the story to an audience at the New York Film Festival: "I thought it was a good time to raise the idea of using fear to stifle political debate." Having majored in journalism in college, Clooney was well-versed in the subject matter. His father, Nick Clooney, was a television journalist for many years, appearing as an anchorman in Cincinnati, Ohio, Salt Lake City, Utah, Los Angeles, California, and Buffalo, New York. The elder Clooney also ran for Congress in 2004. George Clooney was paid $1 each for writing, directing, and acting in Good Night, and Good Luck., which cost $7.5 million to make. Due to an injury he received on the set of Syriana a few months earlier, Clooney could not pass the tests to be insured. He then mortgaged his own house in Los Angeles in order to make the film. Dallas Mavericks owner Mark Cuban and former eBay president Jeff Skoll invested money in the project as executive producers. The film ultimately grossed more than $54 million worldwide. The CBS offices and studios seen in the movie were all sets on a soundstage. To accomplish a pair of scenes showing characters going up an elevator, different "floors" of the building were laid out on the same level. The "elevator" was actually built on a large turntable at the intersection of the two floor sets, and rotated once the doors were closed. When the doors reopened, the actors appeared to be in a different location. In doing so, the movie exercised a bit of dramatic license—the CBS executive offices at the time were located at 485 Madison Avenue. CBS News was located in an office building just north of Grand Central Terminal (demolished and now the site of the Met Life Building); and the See It Now studio was located in Grand Central Terminal itself, above the waiting room. For dramatic effect, all three areas were depicted as being in the same building. Clooney and producer Grant Heslov decided to use only archival footage of Joseph McCarthy in his depiction. As all of that footage was black-and-white, that determined the color scheme of the film. A young Robert Kennedy is also shown in the movie during McCarthy's hearing sessions. He was then a staff member on the Senate subcommittee chaired by McCarthy. A small jazz combo starring jazz singer Dianne Reeves was hired to record the soundtrack to the movie. This combo (Peter Martin, Christoph Luty, Jeff Hamilton and Matt Catingub) was featured in the movie in several scenes; for example, in one scene the newsmen pass a studio where she is recording with the rest of the band. The CD is Dianne Reeves's second featuring jazz standards (including "How High the Moon", "I've Got My Eyes on You", "Too Close For Comfort", "Straighten Up and Fly Right" and "One for My Baby"), and it won the Grammy Award in 2006 for Best Jazz Vocal Album. The soundtrack to Good Night, and Good Luck. was released on September 27, 2005. The film's score was composed and conducted by Basil Poledouris. The film was critically acclaimed upon release. It was named "Best Reviewed Film of 2005 in Limited Release" by Rotten Tomatoes, where it achieved a 93% positive review rating, based on reviews from 217 critics. The film received six Academy Award nominations, including Best Picture, Director (Clooney), and Actor (Strathairn). Roger Ebert, in his Chicago Sun-Times review, contends that "the movie is not really about the abuses of McCarthy, but about the process by which Murrow and his team eventually brought about his downfall (some would say his self-destruction). It is like a morality play, from which we learn how journalists should behave. It shows Murrow as fearless, but not flawless." Margaret Pomeranz and David Stratton from the ABC show At the Movies each gave the film five stars, making Good Night, and Good Luck the only other film besides Brokeback Mountain to receive such a score from the hosts in 2005. Both described the film as "beautiful" but also praised Clooney for the film's importance. Margaret commented that "[The film] is so important, because it's about things that are really vital today, like the responsibility of the press and examining the press' role in forming opinion." David noted "Though [the film] is in black-and-white, there's nothing monochromatic about Clooney's passion for his subject or the importance of his message." Jack Shafer, a libertarian-leaning columnist for the online magazine Slate, accused the film of continuing what he characterizes as the hagiography of Murrow. Clooney's film gives the impression that Murrow brought down McCarthy single-handedly, while Shafer notes that in reality much of the mainstream media, many Democrats and some of McCarthy's Republican peers were condemning him before Murrow. Furthermore, Shafer writes, evidence obtained via the declassified Venona espionage program confirmed that many Soviet agents and sympathizers were in fact in positions of influence in the U.S. government, a disclosure the film entirely overlooks: "Clooney and company ignore the material that might argue against their simple-minded thesis about Murrow, the era, and the press to produce an after-school special". One complaint about the film among test audiences was their belief that the actor playing McCarthy was too over the top, not realizing that the film used actual archive footage of McCarthy himself. Main article: List of accolades received by Good Night, and Good Luck. The film was nominated for six Academy Awards at the 2006 Academy Awards, for six BAFTAs at the 2005 BAFTA Awards, and four Golden Globes at the 2006 Golden Globe Awards. The American Film Institute named Good Night, and Good Luck. as one of the Top Ten Movies of 2005. ^ a b Brooks, Brian. "Clooney Speaks Out About Journalism and Filmmaking As NYFF Opens". IndieWire. Retrieved: April 24, 2007. ^ Friedman, Roger. "Clooney Bets House on New Film. Fox News. September 27, 2005. Retrieved: December 30, 2007. ^ "Good Night, and Good Luck. (2005)". Box Office Mojo. ^ Schwartz, David, via Les Burkhardt, "Studio Originations for CBS New York based shows", Retired CBS Engineers Association website, December 2–3, 2001. Retrieved 2016-02-02. ^ Vo, Alex (January 13, 2009). "10 Years of Golden Tomatoes". Rotten Tomatoes. Retrieved 9 August 2017. ^ "Good Night, and Good Luck (2005)". Rotten Tomatoes. Retrieved 9 August 2017. ^ "Winners & Nominees: View by Film: G". Oscars.org. 2006. Retrieved 9 August 2017. ^ Ebert, Roger. 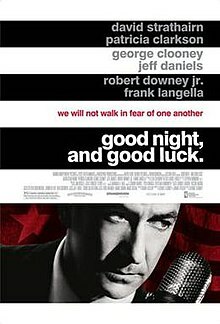 "Good Night, and Good Luck Movie Review (2005)". Chicago Sun-Times. Retrieved April 23, 2007. ^ Pomeranz, Margaret; Stratton, David. "Movie Reviews by Year: 2005". At the Movies. Australia: ABC. Retrieved 9 August 2017. ^ Stratton, David. "Good Night, and Good Luck (review)". At the Movies. Australia: ABC. Retrieved 9 August 2017. ^ Shafer, Jack (October 5, 2005). "Edward R. Movie: Good Night, and Good Luck and Bad History (Part 1)". Slate. Retrieved 9 August 2017. ^ Sandhu, Sukhdev (5 October 2005). "When Television Took a Stand". The Daily Telegraph. London. Retrieved 9 August 2017. Wikiquote has quotations related to: Good Night, and Good Luck.